A few months ago I shared a post on applications for mind mapping. Today's short post features mind mapping by hand. I use mind mapping frequently to capture ideas and to plan presentations, blog posts, and details for projects. I use a small notebook to record ideas, occasional shopping lists, and ideas that might result in posts. At the time I am ready to create a post, I will create a mind map. 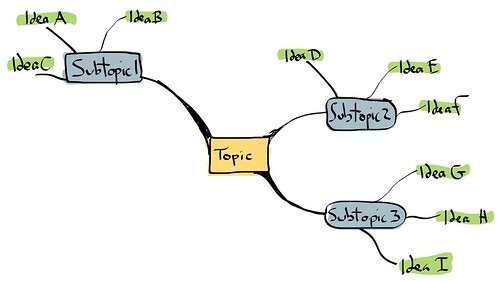 For me, the mind mapping technique is more creative than simple outlining. Part of the power behind mapping is that you can jot down ideas as they come to without needing to be in sequential or organizational order. The mind maps below are very simple for illustrative purposes. After determining the Topic and Subtopics, I can jump from idea to idea, so that I might think about Idea A then Idea G followed by Idea B, etc. This style of mapping, with a different color for each level is typically how I draw mind maps. I usually have a pen with me and use highlighters to color the different levels. This mind map was drawn using the Adobe Ideas app for the iPad. 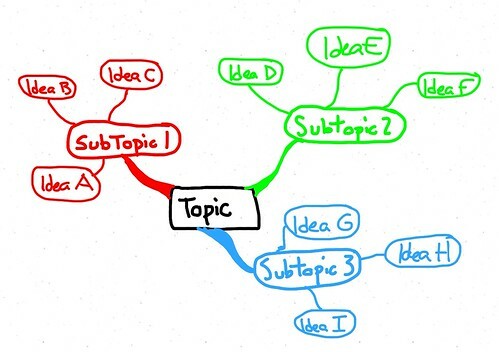 This next mind map was drawn in the traditional style with one color per subtopic. This mind map was drawn using the UPAD note taking app. 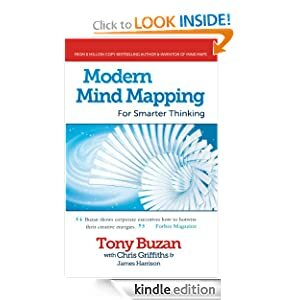 For more on mind mapping, I recommend Tony Buzan's Modern Mind Mapping.